Washington, D.C. – Calvary Women’s Services announced it is a recipient of the Neighborhood Builders award from Bank of America. Calvary is being recognized for its expanded housing and improved employment programs for homeless women across the Washington, D.C. area. The award combines leadership development resources with $200,000 of flexible funding intended to help increase the organization’s capacity and impact. Calvary Women’s Services aims to provide a safe, caring place for women in need, and embolden them to live successful lives by offering transitional and permanent housing, case management, life skills and education opportunities, health and wellness services and daily addiction recovery treatment. 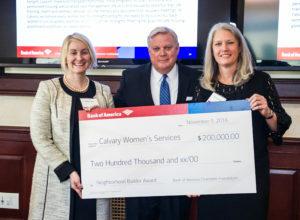 The Neighborhood Builders (#NeighborhoodBuilders) grant will enable Calvary to move forward with development of a new permanent affordable housing program for women. This program will support at least 20 women who are facing challenges including substance addiction; mental illness; and histories of violence and trauma. According to the December 2016 U.S. Conference of Mayors’ Report on “Hunger and Homelessness” Washington, D.C. had one of the fastest increases in homelessness between 2009 and 2016, with a 34.1 percent gain. Calvary provides integrated care and personal, one-on-one support to each woman in its program. Each year, 70 percent of women who complete Calvary’s programs successfully move into their own homes. Neighborhood Builders is a signature demonstration of the bank’s work to address issues fundamental to economic mobility in order to build thriving communities and illustrates how strong cross-sector partnerships and local community leaders can play a meaningful role in positioning communities for success. Calvary Women’s Services offers housing, health, employment and education programs that empower homeless women in Washington, DC to change their lives. Founded in 1983, our programs carry out our mission to offer “a safe, caring place for tonight; support, hope and change for tomorrow.” These programs include transitional and permanent housing, personalized case management, life skills and education opportunities, job training, health and wellness services, on-site therapy, and daily addiction recovery meetings. At Calvary, we believe that every woman has the strengths and gifts she needs to be successful. Each woman in our programs identifies and builds on her strengths, meeting her goals for safe housing, good health, and financial independence. We know that our programs work: every five days, a woman moves from Calvary into her own home. Learn more at www.calvaryservices.org.